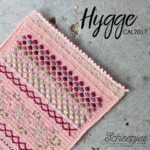 I am sure that you have all heard of the Hygge CAL by now. 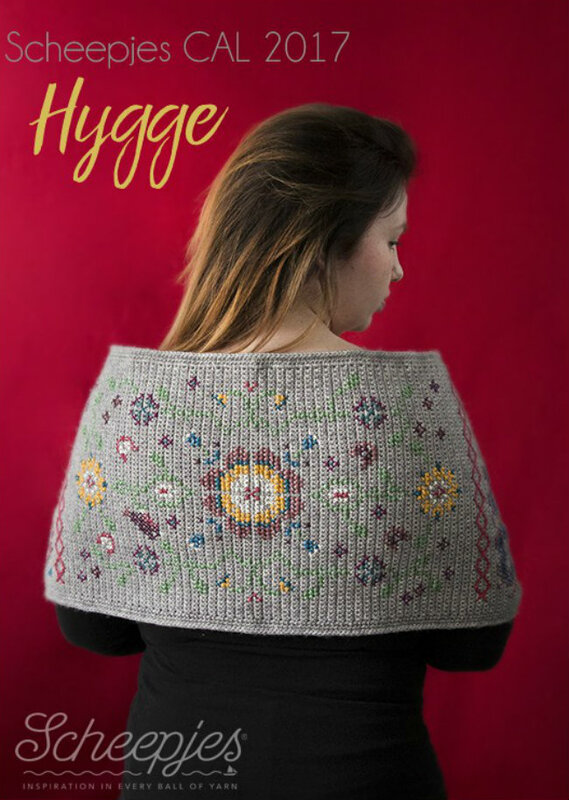 Designed by Kirsten Ballering, the Hygge Shawl is gorgeous and unique! 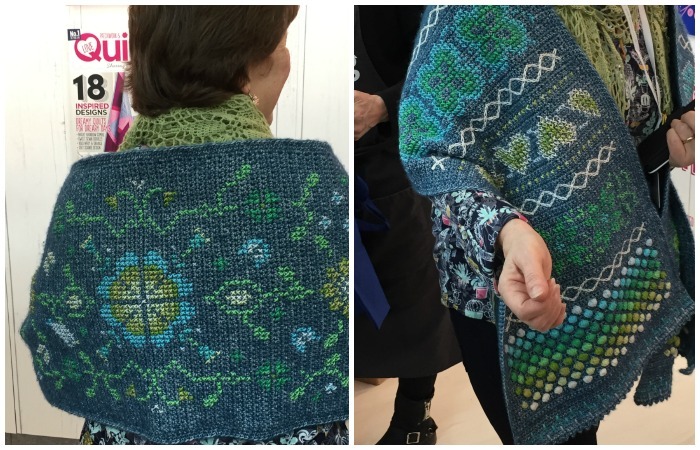 At our last Scheepjes Bloggers Weekend, we had the wonderful privilege of seeing the shawls ‘in real life’, and I cannot tell you how hard it was for me NOT to share the photos with you immediately. 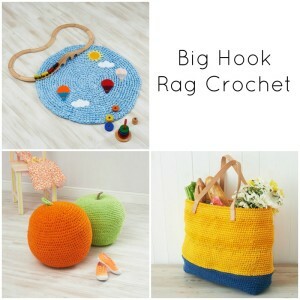 I love the fact that designers can still come up with new concepts despite the fact that crochet has been around forever! Before I start the informal, chatty part of this post, I am going to share the CAL information and some of the official teaser pictures. Once that is out of the way, I hope you will settle down with a cup of tea and read the rest of the post. ‘Hygge’ (Danish) means cosiness, but it is more than just a word; it is a lifestyle philosophy that encourages you to focus on the good things in life: friends, family, comfort, joy, love, togetherness, and peace. The Hygge CAL started on Wednesday the 15th of February 2017 and will last for 14 weeks. 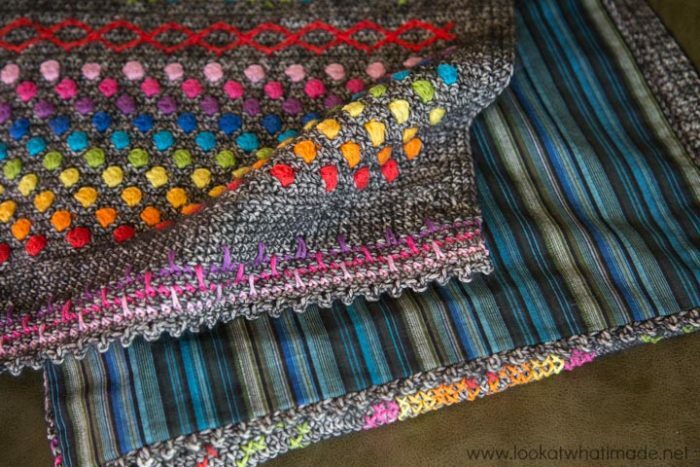 It sees you making a rectangular winter shawl that is 180 cm long by 36 cm wide (depending on personal gauge). 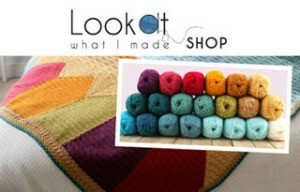 The pattern is available in US and UK terminology, with video tutorials by Esther from It’s All in a Nutshell. 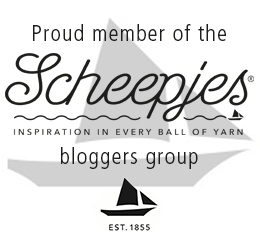 You can find all the information for the CAL on Scheepjes.com, and if you would like to be part of the online CAL community, you can join one of the Facebook groups (Dutch and International). 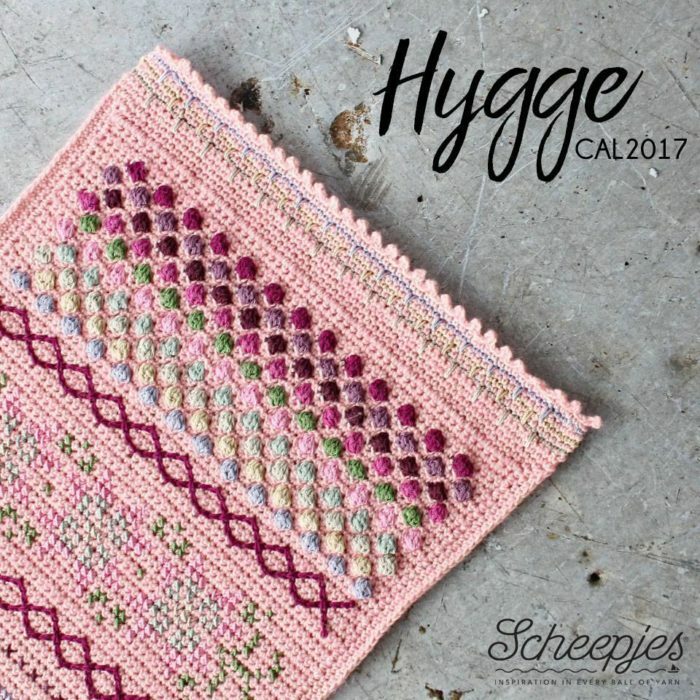 Kits for the Hygge CAL contain 10 balls of Stone Washed, 11 balls of Catona, and lots of extra goodies. They are available in 5 colourways: Rainbow, Pastel, Jewel, The Danish Mermaid (Simy’s Choice) & Girls Night In. 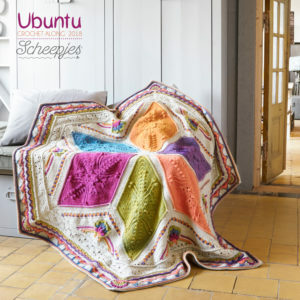 You can visit Scheepjes for a full list of stockists. 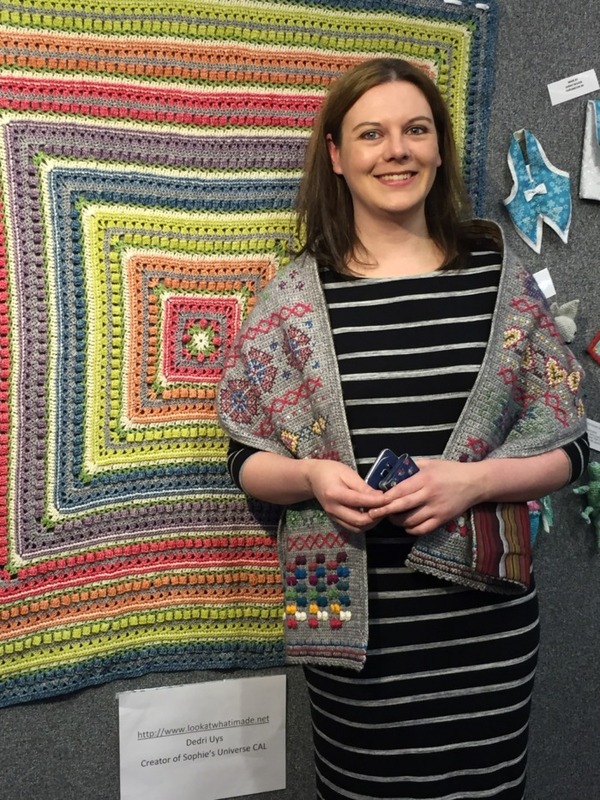 I had the pleasure of spending an afternoon with Kirsten at the Knitting and Stitching Show last weekend. I will tell you more about that in a minute, but for now, I just want to say that it was lovely to see how many people came up to her to say hi and share their progress. 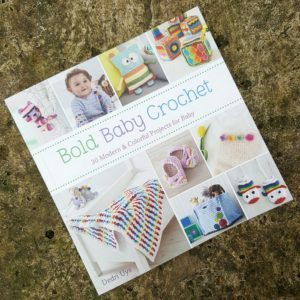 It was a tangible reminder of how a crochet project can reach beyond the mere stitches to touch people’s lives. 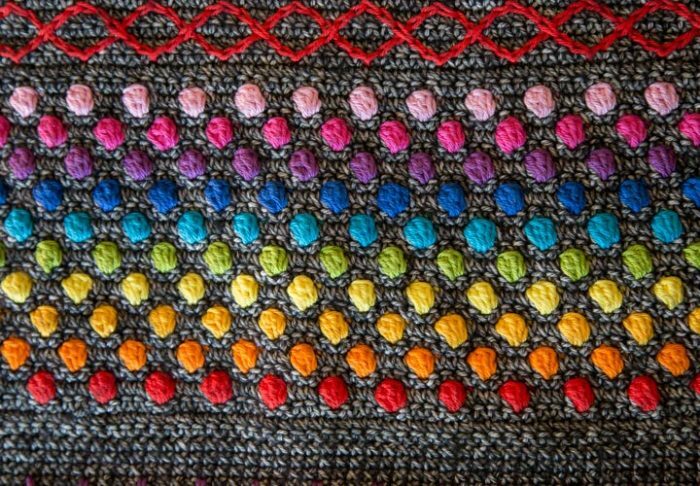 The Hygge Shawl is a dense rectangular wrap with lots of colourful surface crochet and cross stitch detail. I know! 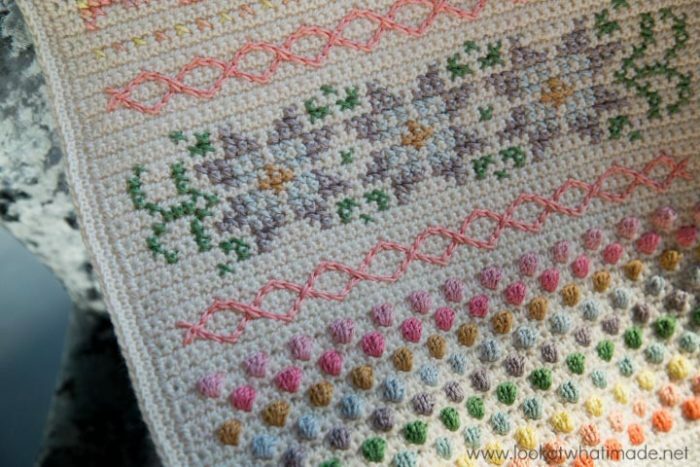 If you don’t cross stitch, this can seem daunting, but it isn’t, actually. 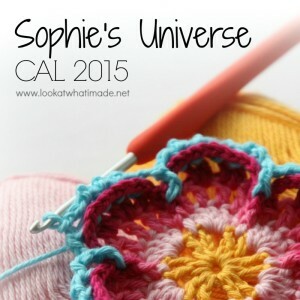 Think of it as a meditative way to learn a new skill with the online help of a great community! 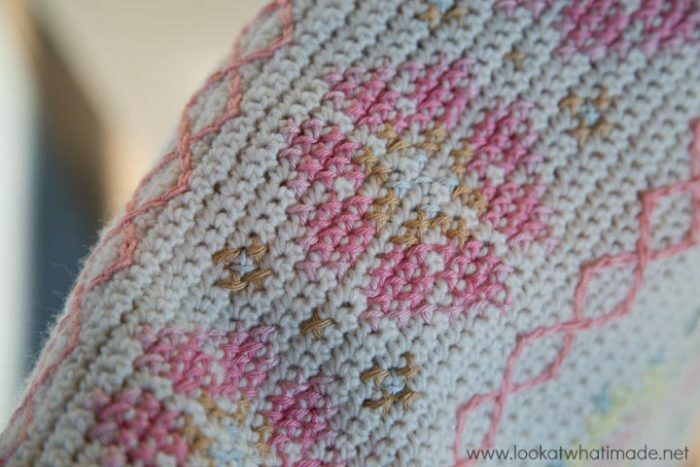 Due to the amount of cross stitch detail, it is recommended that you line your shawl with fabric (another new skill if you haven’t already mastered it). 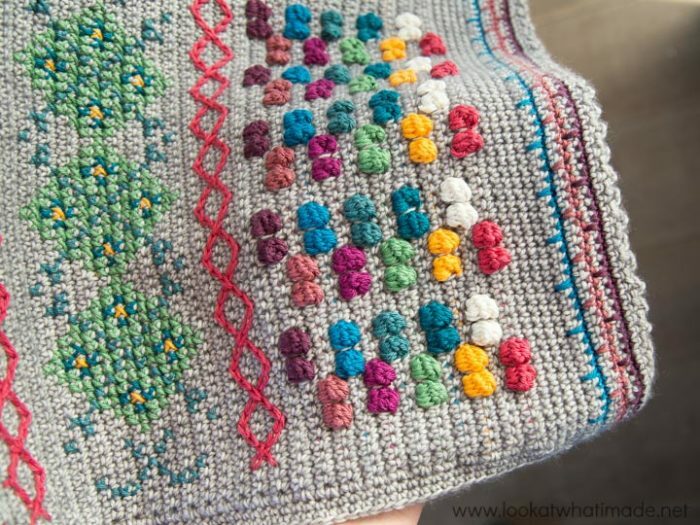 Some people are concerned that this will make the shawl stiff, but they are not meant to be lacy, drapey shawls, they are meant to be warm, cozy winter wraps, and the ones I have seen have had plenty of ‘drape’. Of all the colourways, Rainbow is my favourite. 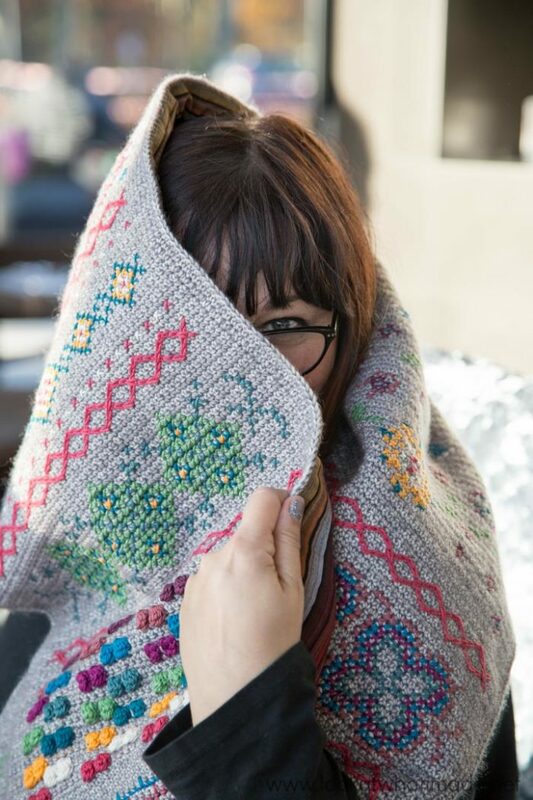 When we went to Unravel in February, Esther wore her Rainbow Hygge as we walked around the show. People kept stopping her to admire it and enquire about it :) I’ve nicked this photo from Nerissa’s Instagram feed; partly to show you Esther’s wrap, but mostly because these girls are my ‘tribe’ and this photo, for me, embodies the ‘Hygge’ theme of the CAL. Jewel is my second favourite colourway, probably because it suits my wardrobe better and still has plenty of colours. It is more muted than Rainbow, but the overall effect is just as striking. 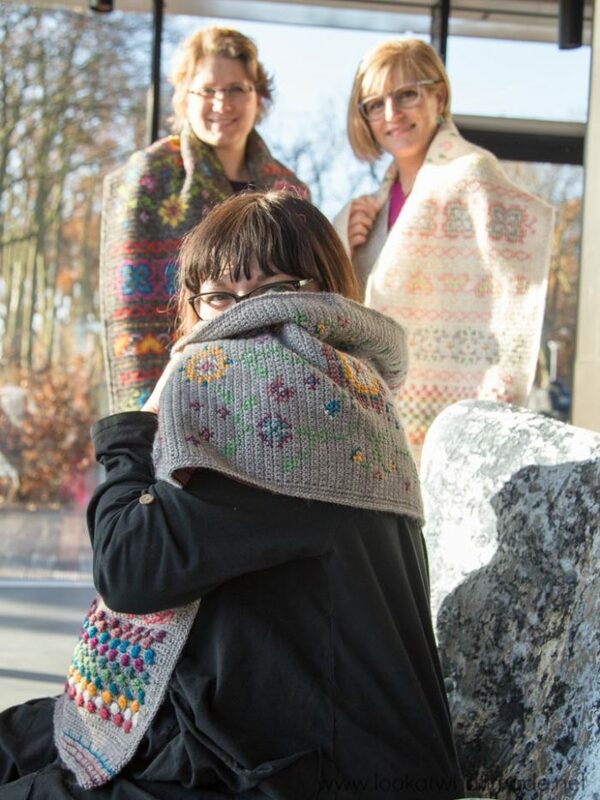 This is my favourite photo of the Jewel Hygge Shawl. Sarah kept hiding her face, which is funny because she was so insistent about taking photos of all the other bloggers (including a very unwilling me). 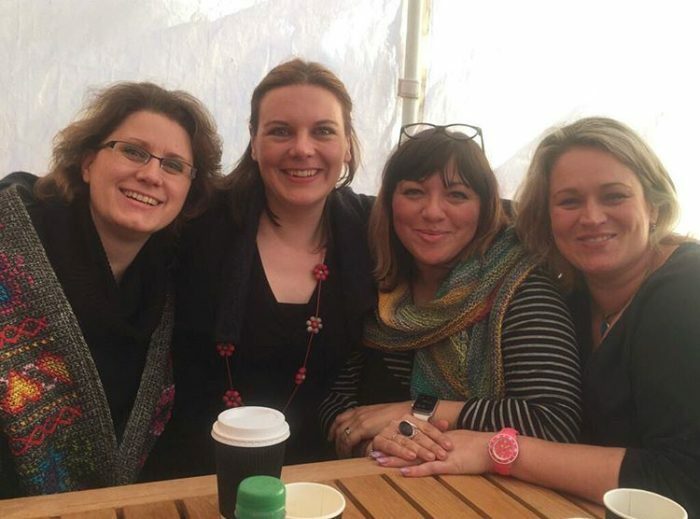 When I met up with Kirsten at the Knitting and Stitching Show, I asked her if I could wear the Jewel shawl for a bit while I walked around, ostensibly to promote it, but really because I just WANT one of my own, even if only for an hour. This is me (wearing Jewel) in front of the Namaqualand blanket (designed my me, made by my friend Kay, and displayed at the WI stall). And now I have to take a totally random detour. Not only am I a yarn geek, but Christiaan and I are also Zombie geeks (and once upon a far-away time, World of Warcraft geeks). the (Zombie) roar coming from Olympia as I walked back to the station after the show (and dinner) at 11 PM, and having to detour into the neighbourhood I used to live in when I first came to England because the police had closed the main road that leads to Hammersmith Station (and my way home). 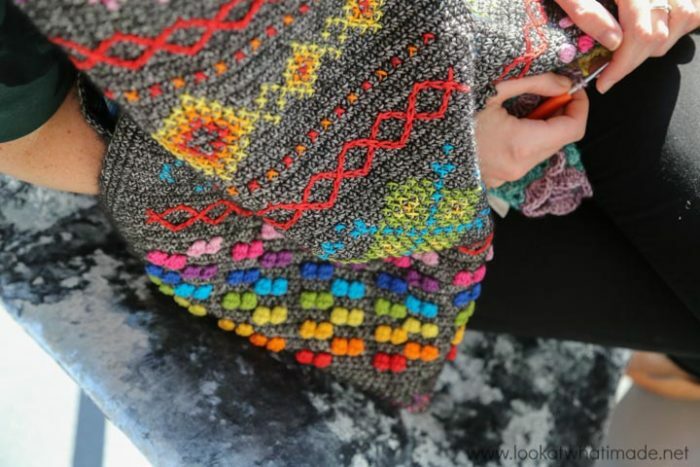 As I am typing this, I realize that I should really make a Jewel shawl for myself now and that it might actually be my favourite colourway (for sentimental reasons), not my second favourite! The Pastel colourway is more about elegance than colour, although it still has a variety of (mostly warm) colours. When I think of the Pastel Hygge Shawl, I can imagine it draped around regal shoulders on a Royal winter outing… ooh, or wrapped around a bride (someone, please do that and share photos)! Since the start of the CAL, 2 more colourways have been added: The Danish Mermaid (Simy’s Choice) and Girls Night In. Unfortunately, I have not had the privilege of seeing a Girls Night In shawl in person, but from the promotional photos, it looks sophisticated and playful. 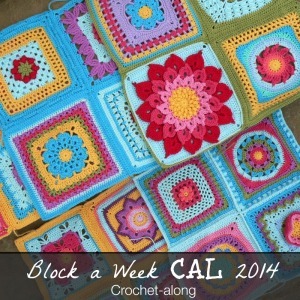 Tammy from Canadutch is making one, and you can read her post about it HERE. 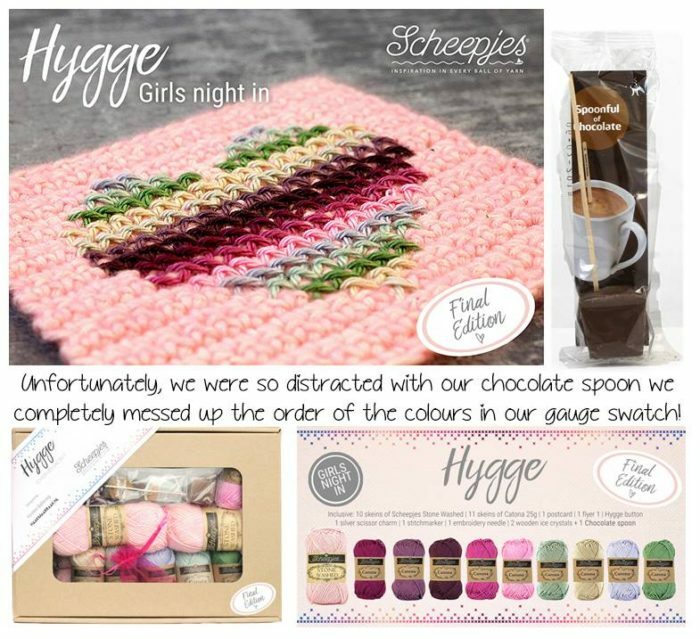 If I am honest, the ‘spoonful of chocolate’ included in the kit is what pushes this version right up to my third favourite (yes, sometimes chocolate trumps yarn…and chocolate AND yarn trumps yarn every day of the week). 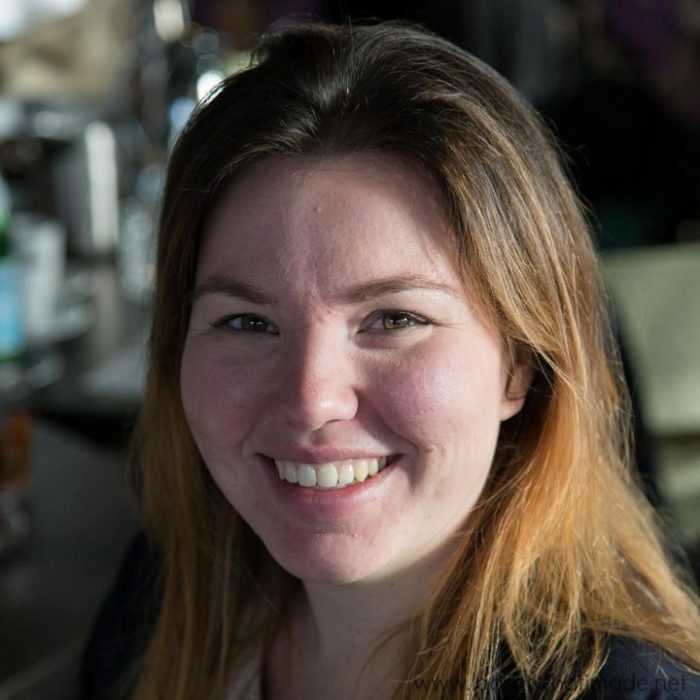 Claire Norden has designed some gorgeous Hygge posters. They are available as free downloads in all five colourways HERE. 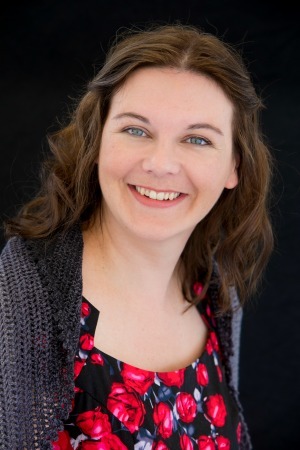 I met Claire at my Be Inspired Tour in South Africa, and she is every bit as lovely as her art! If you are interested in learning more about the Hygge concept, ‘The Little Book of Hygge‘ comes highly recommended. I haven’t bought it yet, but it’s on my wishlist. 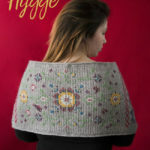 I would love to know if any of you are making a Hygge Shawl (or 5) and what your favourite part is. If you feel like sharing your favourite colourway, that would be great too! Thanks for all your updates & the time you take to keep sooooo many of us hookers, from all over the world, busy! 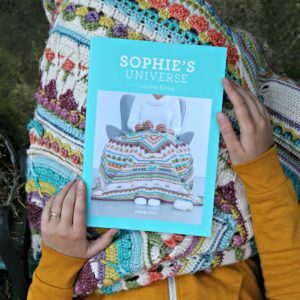 I was so happy to show my husband the photo of Esther wearing Jewel (which I’m making for beautiful cousin)& yourself as I’m working on your Sophie with Esther as my guide, mind, your beautiful book (a very big congratulations btw!!!) is always open at the corresponding page. Many thanks Dedri, for being a big part of my happy life. Melissa aka JassyJay on Facebook. I found the Designed by Clair site with the definition and pronunciation of Hygge. This CAL is beautiful! 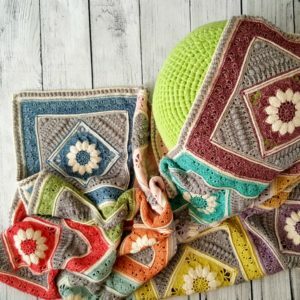 I can’t decide which colors I like best but then again I can’t get this yarn here in the US and can’t spend the money to have it shipped either. I do think I would lean towards the Girls Night In colorway if I could. I would like to know what Hygge means and what the proper pronunciation would be. 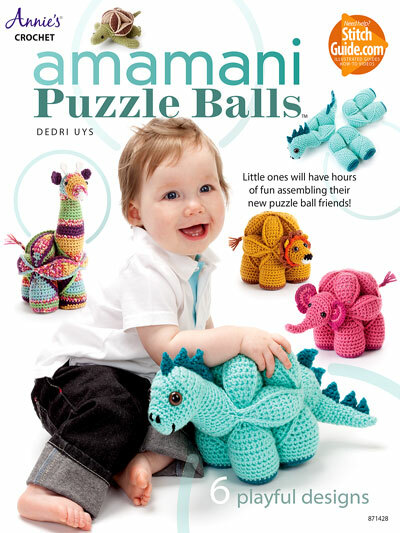 As always….thank you for all you bring into all of our lives…color, crochet, and most of all….FUN. 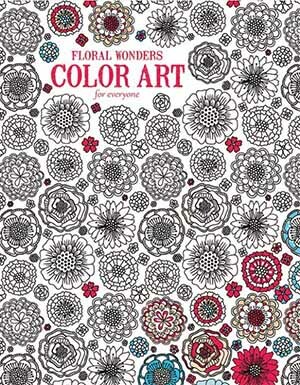 I’m making the rainbow version and another in my own colors, which I called English Garden (green, purple and pink tones). This far I like all the parts, it is so much fun to work on them. Ooh, English Garden sounds lovely :) Have you shared any photos online?